The guidance document has been produced to help football fans and others identify racist, neo-Nazi, homophobic, abusive images towards disabled people and other discriminatory banners from stadiums. It is regrettable, but a fact, that far-right groups are active in stadiums spreading hatred and using football as a means of social division. 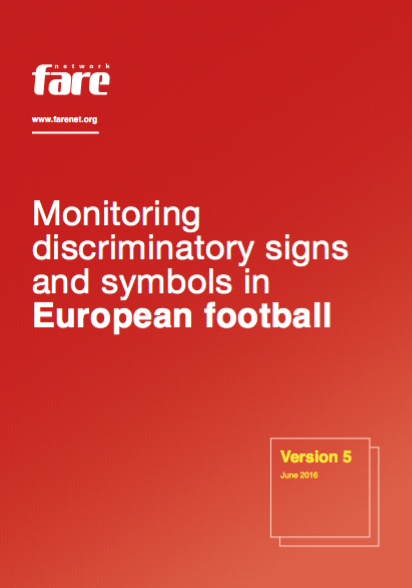 This guide includes symbols displayed at stadiums by far-right groups who commit discriminatory acts using the symbols of nationalist organisations or movements. The guide is a practical tool for fans, stewards, the media and a wider audience to recognise offensive and discriminatory symbols at stadiums. It was prepared on the basis of the extensive monitoring experience of members of the Fare network. The guide does not constitute a full list of symbols prohibited by legal systems or by football authorities. Fare has no authority to ban any symbols or their use, the use of political symbols in football settings are regulated by national level FA statutes and the disciplinary codes of UEFA (and other confederations) and FIFA. Fare records and draws public attention to instances of discrimination inside football stadiums. The Fare network has no influence on FIFA or UEFA disciplinary processes. Some symbols included in the guide might not be discriminatory in all contexts, but highly offensive in others.